Image caption The London Ambulance Service rating has gone from "inadequate" to "requires improvement"
The London Ambulance Service has made "significant progress" since being put into special measures eighteen months ago, according to the health watchdog. The service's rating was increased to "requires improvement" in a report by the Care Quality Commission (CQC). Crews were also praised for their "care and compassion" during the Grenfell Tower fire and recent terror attacks. 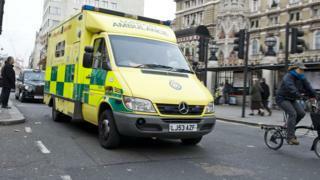 The service "should exit special measures within a few months" the CQC report said. The Chief Inspector of Hospitals Sir Mike Richards said: "The events of the last few months have underlined what a crucial service London Ambulance provide to the capital. "Overall, the trust has made sustained progress since our last inspection." But "there is more work still to do" he added. The CQC will undertake a "well-led review in about six months' time" once a newly appointed leadership teams has had a chance to "settle in".